Short for web log, a blog is a web page that serves as a publicly accessible personal journal. New content is published by the blog’s author on a regular basis, often daily. Most blogs are a mixture of what is happening in a person’s life and what is happening on the Web, but there are as many unique types of blogs as there are people. In recent years, blogs have played an important role in the delivery of real time commentary on important events, such as the presidential elections. Blogs differ from traditional sites in that rather than being composed of individual web pages connected by hyperlinks, they consist of a template into which content is fed from a database. Each new item submitted to the blog is known as a post, and may include hyperlinks to other sites on the Web. 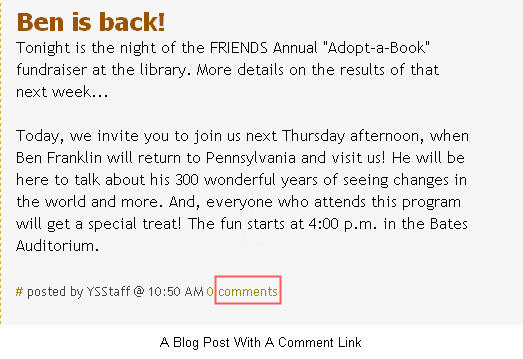 A key feature of a blog is that visitors to the blog can submit comments on any of the posts using a simple form. Each post on a blog will have a link at the bottom that will allow the person visiting the blog to view any comments submitted by others. 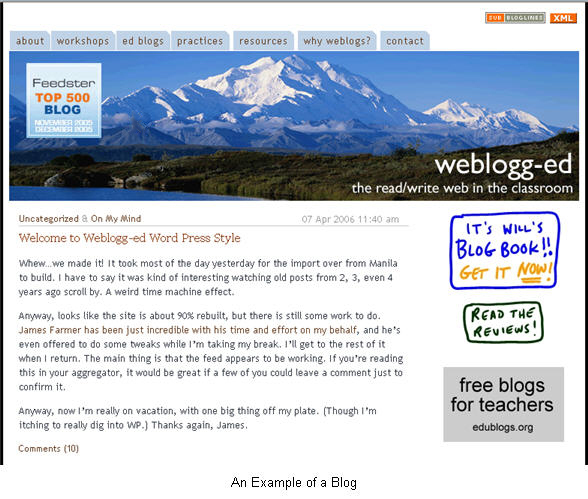 Blogs also support the use of tags to place posts into categories. The tags can be used later to search for posts that refer to a specific topic. Blogs allow for the easy creation of new content, which is usually entered into a simple form and then submitted to a blogging system. The blogging system takes care of adding the content to the blog’s main page, applying the formatting specified in the template chosen by the blog’s author, and creating any links to other sites referenced in the post. The blogging system will also automatically move older items to an archive page. 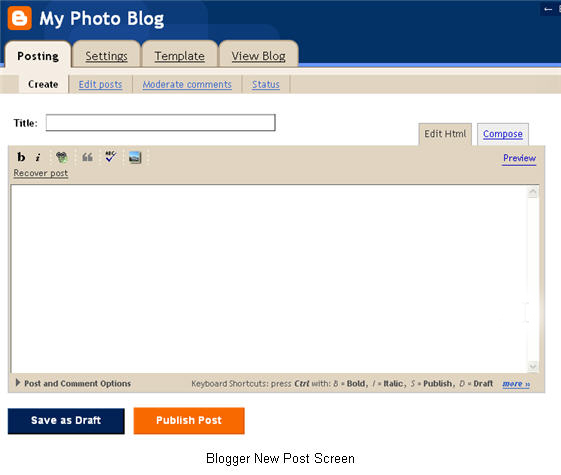 There are several free blogging systems that can be used to host blogging content. One of the most popular is Blogger, which is owned by the search company Google. In addition to providing a system for creating blogs, Blogger provides free space to host the blog on their servers. Blogs can be used in the classroom to start up an online discussion on any topic, ranging from reflections on current events to online versions of reading journals.